Prolific child actor, Joey King (Wish I Was Here, FX’s Fargo) is attached to star in Corn Bred Films’ “Oriole Park,” shooting this fall on location in Chicago. Joel Murray (Mad Men, God Bless America), Tom Arnold (Hit & Run, Happy Endings), Christian Stolte (Chicago Fire) and Thomas Beaudoin (Other Plans) round out the cast attachments. The producers are currently in the process of filling the role of Joey King’s father in the film. Principal photography commences in October. 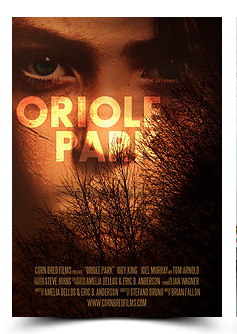 ORIOLE PARK follows a young woman struggling with the death of her mother and her father’s descent into alcoholism in late 1978, just as the Chicago neighborhood she lives in is rocked by a string of disappearances leading up to the arrest of serial killer John Wayne Gacy. The coming-of-age story balances drama, teenage romance and suspense while exploring the effects of violence within a small, tight-knit community. The project will be helmed by Kevin Slack, whose short film ‘The Drought’ was a finalist among 15,000 submissions in Youtube/Ridley Scott’s “Your Film Festival” and screened at the Venice Film Festival. Slack is also an accomplished music video director whose work includes The Gaslight Anthem’s “Here Comes My Man” and “Handwritten,” both of which have amassed more than 1 million views each online. Gold record recording artist Brian Fallon, lead singer of The Gaslight Anthem, will compose the film’s soundtrack. Chicago-based Corn Bred Films’ Amelia Dellos and Eric Anderson co-wrote the screenplay, which was inspired by true events from Dellos’ childhood. The duo’s previous films include the documentary project Love Under Fire: The Story of Bertha and Potter Palmer and Other Plans, a romantic comedy starring Jamie Kennedy, Rebecca Blumhagen, and Malik Yoba. Chicago entrepreneur Steve Johns has joined the project as Executive Producer, and Morris Ruskin’s LA-based international sales agency Shoreline Entertainment has acquired the worldwide sales rights to the film.